Discussion in 'Support' started by RHY3756547, Feb 20, 2016. Current build defaults to DX. On Intel GMA 3150 CAS works but then the game carsh with "Parameter is incorrect" error. OK, looks like old GMAs (3150/950) do not support Multi-Target render and the Single surface format, which means supporting them would require a lot of effort. Just ignore it for now. I assume its the same issue, but providing this info regardless in case it helps in the future. On a "Intel(R) Core(TM)2 Duo CPU E6550" I get a bit further, I can navigate the map screen, but once I enter a lot I receive the "Parameter is incorrect" error. This is on the "Open beta ready" build using the "-dx11" flag. This is to do with multiple render targets. Since then I introduced a special mode for non-MRT for iOS and Android, but it is disabled. I might make it possible to enable this via the config file, but it is hard to detect. Intel g41 express chipset will run the freeso? Taking advantage of a snow day off from work I've gotten a little further with this. The "Parameter is incorrect" error is caused by SurfaceFormat.Alpha8 which older hardware does not support, after changing this to Color instead the game loads further but the depth errors indeed come up. SoftwareDepth as it stands now does not work out of the box, so I am currently seeing if it can be adapted. The shader complexity is the exact standstill I'm at, and what I meant by not working out of the box. OpenGL is out of the question for older hardware as monogame complains that it requires at least 3.0, and on 3.0 capable hardware none of this should be a problem. - Colour channel for wall pattern. - Ambient Light texture for room lighting. Note that the mask dependency is only used for walls. For sprites, the current setup should work. Fully 3D walls vs sprites. This is planned in the future and will allow optimisations, graphical improvements and more complex architecture tools. Very large scale change, will be done after 3D floors (needed for terrain with the possibility of floors placed on slopes). Depth on walls does not actually need to use a texture, as it is a flat plane. Can instead set depth values for the 4 corner vertices of the sprite and let the pixel shader interpolate it for you. Would need reuse of a vertex attribute or an additional one. Disable room lighting... Not recommended. Bake masks into colour channels... Too many combinations and memory management involved. Not sure, but I believe this has been my problem. I fixed by going to run. type dxcpl. click edit list. add exe of game. I wasn't sure what ones to add so I added them all refer to pic below. now I can play but it takes several mins to load freeso.ml, and the only way I have been able to get into the empty lot is too zoom in and D-click several times and wait. also have to click several times on the build/buy mode. I have to click several times before anything changes. IE to place a tile, click three or four times before it stays. to change to a different tile, I have to click several times before it changes. I'm not complaining just letting you know what to expect anything is better then nothing. Um, I have Intel GMA X4500, Whenever I enter a property I crash instantly. Please help me. 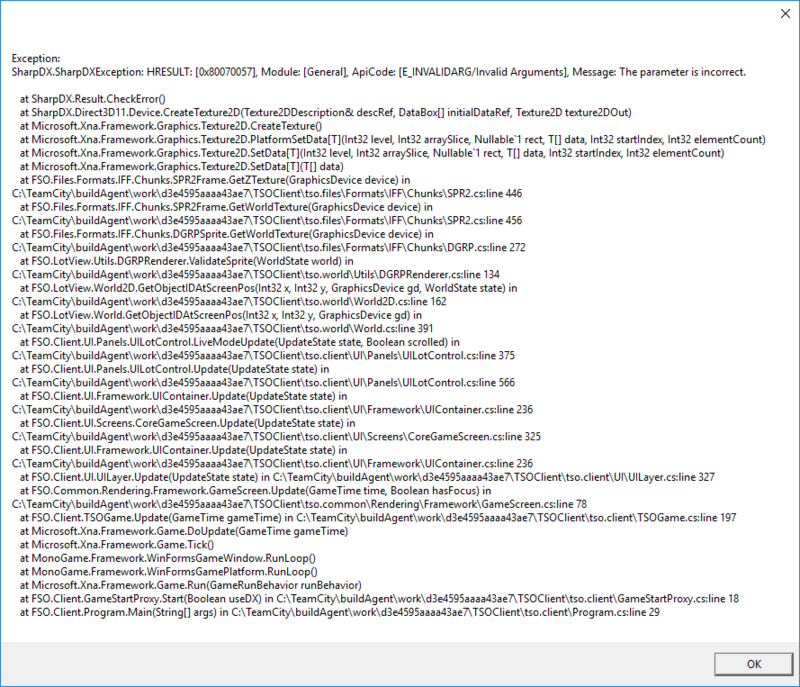 I can't run FreeSO because I don't have OpenGL, and DX11 mode also crashes at start (External component etc etc). Using latest build I believe. Intel GMA 950. Not supported, right? The link is not working anymore!